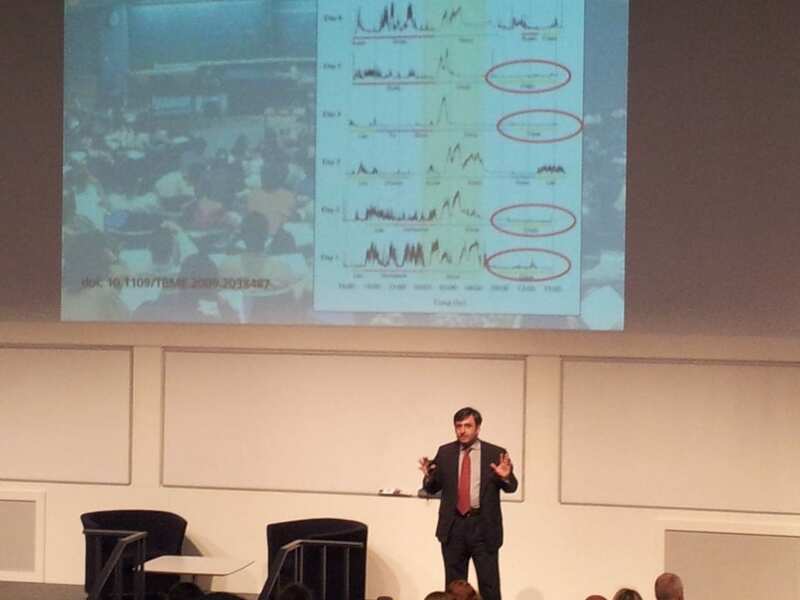 In the first plenary session for the ALT-C conference this year, Eric Mazur from Harvard University spoke about how student’s brain activity slows during lectures. 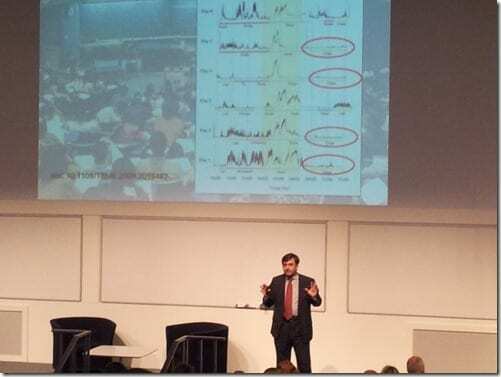 The highlighted area to the immediate left of the circled lecture periods in the graph below shows that student’s brains are more active during sleep than during traditional lectures. Eric argues that analysing classroom data is essential to improving teaching. So how do students actually learn? Information transfer is the easy part. The hard part where students need to understand the concepts is often being left to students to do on their own. Eric Mazur realised that most of his own “ah-hah” moments of understanding came outside of the classroom. He now uses voting handsets to involve students in his lectures. After voting he asks students to find someone who disagrees with their answer and then try to convince their neighbour why their own answer is correct. His collaborative approach to teaching ensures students stay engaged during lectures. 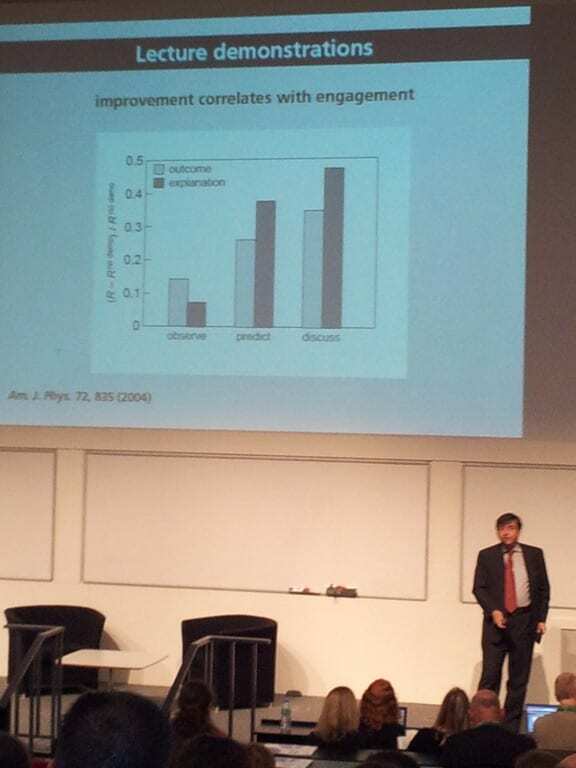 Women in particular thrive in a collaborative environment as opposed to a competitive one, so they perform better when he involves them in his lectures. He also encourages students to work together to complete their homework. Lecture demonstrations are not as effective as students doing the activity themselves because students may make incorrect assumptions about what the demonstrator has done to achieve the results. Asking students to predict the outcome of the demonstration, record their observation of the demo and then discuss whether they correctly predicted the outcome of the demonstration with their peers leads to a better understanding of the core concepts. The reason for this is that “the brain stores models not facts.” You need to give students time to re-adjust their models in the lecture. Otherwise students are more likely to continue to believe in their incorrect models. This effect is known in psychology as cognitive dissonance. Predicting, explaining and discussing the concepts makes a significant difference in the ability for students to absorb the correct models. The graph below shows a significant improvement in understanding by those students who had predicted the demonstration results and an even higher improvement by those who also discussed their predications after the demonstration. It’s difficult to teach students who have the wrong model, because teachers who understand the correct model find it difficult to understand where these students are coming from. Asking students to show their working out helps teachers to understand their misconceptions. Instead of just marking incorrect answers as wrong and leaving it at that, Eric Mazur argues that teachers should concentrate on understanding the thinking behind the incorrect answers. That way they can help students to re-adjust their thinking to incorporate the correct models. Read more: Classroom Demonstrations: Learning Tools or Entertainment? 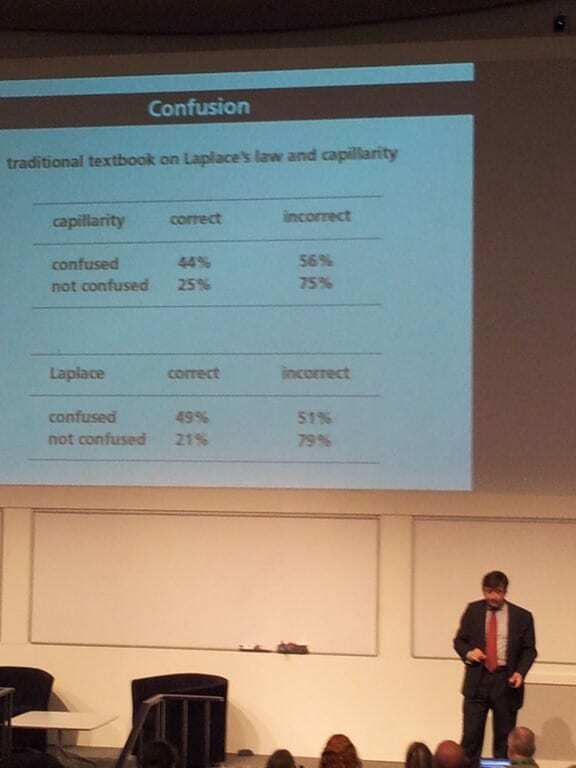 Eric Mazur also asks students to tell him what they find difficult or confusing from their readings before the lecture. He asked students to provide him with at least 2 concepts they found confusing and also some feedback on why they found the items confusing. If they found nothing difficult they had to provide him with two examples of what they found interesting and why. He then adapts his lecture to address the areas students found most difficult to comprehend. This method is known as just in time teaching. You can find out more about this method in the book Just in time teaching: blending active learning with web technology (Novak et al., Prentice Hall, 1999).